“How to increase the return on investment” is the common worry of each one of us who are striving hard to save money and grow financially. One of the methods for investors who believe in risk taking and venture out from non conventional methods like FDs and saving bank account, is investment in dividend yielding stocks or funds. Dividend yield tells you what percentage return a company pays out to shareholders in the form of dividends. Older, well-established companies tend to payout a higher percentage then do younger companies and their dividend history can be more consistent. 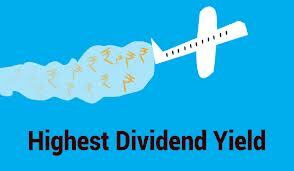 Dividend yield is calculated by dividing the annual dividend per share by the stock’s per-share price. Not all stocks pay dividends, nor should they. If a company is growing quickly and can best benefit shareholders by reinvesting its earnings in the business, that's what it should do. Still, many investors - particularly those nearing retirement -- like a dividend, both for the income and the security it provides. If your company's stock price falters, you always have a dividend. And it is definitely a nice sweetener for a mature stock with steady, but unspectacular growth. High-dividend stocks tend to outperform the broader market over time. Since stocks that pay dividends are generally more conservative and have stronger cash flows than those that do not, investors tend to gravitate toward dividend payers during times of trouble. Dividends, by returning actual cash to shareholders, also provide an indication of the strength of the business underlying the stock. Additionally, companies tend to use their resources more efficiently when they are less plentiful – which cash is once dividends have been paid. Higher dividends mean more cash in the hands of investors, and less in the hands of a management team that may not necessarily make the right decisions. Investors can assemble a high-dividend portfolio in these ways: Buy individual stocks, or invest in dividend-focused mutual funds for sustained returns. When you're searching for stocks with high dividend yields, one quick check you should always make is to look at the company's payout ratio. It tells you what percentage of earnings management is doling out to shareholders in the form of dividends. If the number is above 75% consider it a red flag -- it might mean the company is failing to reinvest enough of its profits in the business. A high payout ratio often means the company's earnings are faltering or that it is trying to entice investors who find little else to get excited about.